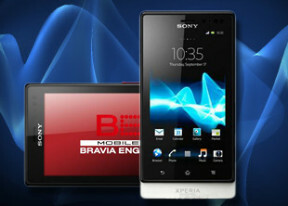 The Sony Xperia sola has quad-band 2G and 3G. Mobile data speeds are boosted by 14.4Mbps HSDPA and 5.76Mbps HSUPA. Local connectivity is covered by Wi-Fi b/g/n with DLNA, so you can easily play media (photos, videos, music) from DLNA-enabled storage devices or push content from your phone to a DLNA TV or music player. Stereo Bluetooth is version 2.1. With NFC support you can read NFC tags but also make the phone act as a tag itself. You can create multiple tags and choose which one you want to share. A tag can be anything from contact info (usually yours so you can send it as a sort of wireless business card), a URL or just plain text. The Xperia sola saves NFC tags you've scanned with it and you can even star some of them for easier access later. Here's an example of what you can do with a Smart Tag - a tag in your car can switch on Bluetooth so the phone pairs up with the car audio, enable GPS and launch the SatNav app and enable text to speech, which will read incoming texts out loud. The browsing performance is excellent - panning, zooming and the text reflow are very fluid. The minimalist UI is still very capable - hit the menu key and six keys pop up. You can open a new tab, switch tabs, refresh the page, go forward, and open bookmarks. The last button reveals even more options (text copying, find on page, etc.). One of the important features in the web browser is the full Flash 11 support. YouTube videos played smoothly all the way up to 720p - no dropped frames, audio lag or video artifacts. Flash games played trouble free too. The Floating Touch display of the Xperia sola can detect fingers hovering over it and the only app that actually uses this feature is the browser. All it can do is highlight links on webpages, adding an extra level of precision, which makes sense on a relatively small 3.7" screen. The Sony Ericsson Xperia sola comes with a solid set of organizing options, including a document viewer. Reading documents is quite comfortable and panning is blazing fast. There's built-in file browser and cloud storage integration (Google, Dropbox, Box). There is also a calculator aboard. It is nicely touch optimized - the buttons are really big and easy to hit. You can expand advanced functions (trigonometry, logarithms) by turning the phone landscape. The alarm clock app supports multiple alarms, each with its own start and repeat time. The Alarms app can also work as a desk clock - you have a big toggle for the brightness, as well as weather info and shortcuts to gallery slideshow and the music player.